Minister Bishop with House of Commons Select Committee on Foreign Affairs. Image via Twitter. As the UK’s Royal Navy Type 23 frigate HMS Sutherland visits Australia during its seven-month deployment in the Indo-Pacific, the federal government has talked up strengthening its trade and security relationship with the UK. 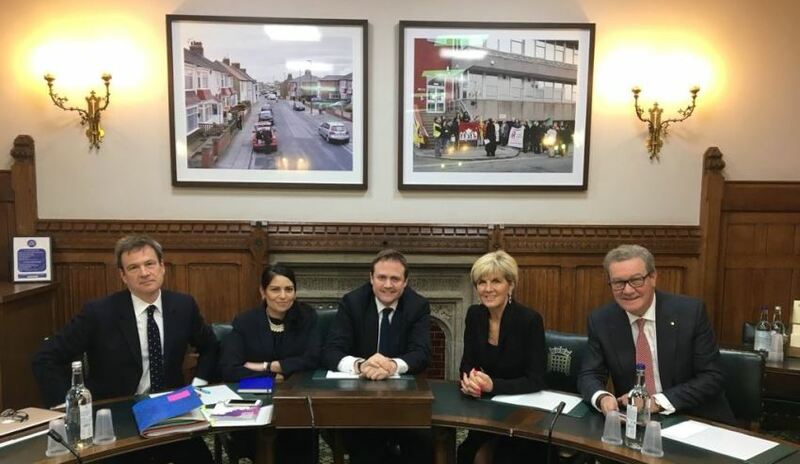 Australia's Foreign Affairs Minister Julie Bishop concluded a trip to the UK last month where she talked up Australia's relationship with the UK, "one of our closest international security partners". The UK government has also been showing its support for a strengthened defence industry relationship with Australia. Under Secretary of State for Defence Procurement Harriett Baldwin visited Australia in November and announced the UK is looking into incorporating the Australian ‘CEAFAR’ radar, developed by CEA Technologies, on future British warships. The radar is already in service with the RAN and a capability study to fit the radar to British ships will begin early next year. If successful, the UK would be the phased array radar's first international customer. Under Secretary Baldwin's visit came just months after Minister for Defence Industry Christopher Pyne and the former secretary of state for defence Sir Michael Fallon held the first ever Aus-UK Ministerial Defence Industry Dialogue, discussing defence materiel and industry co-operation between the nations. Sir Michael said selection of the UK's BAE Systems bid for the SEA 5000 project would create ample defence export and job opportunities for Australia. The British firm and the UK government have also committed to the transfer of more than $1.5 billion of technical design and intellectual property if BAE Systems secured the SEA 5000 project. The UK's Defence and Security Organisation (DSO) have also launched a platform for Australian companies looking to join the supply chain and pursue defence opportunities in the UK. Head of the Defence and Security Organisation Steve Phipson also spoke with Defence Connect at the Pacific 2017 International Maritime Exposition, and said the UK industry is looking to better communicate with Australian industry to establish reciprocal trade with its new supplier registration website. "Very often we hear this, I've had this challenge from the Australian ministers before now about, well, 'how do we get reciprocal trade going?' and it is quite straight forward to do," Phipson said. "I think a lot of it is about communicating the process to make sure that we are able to point Australian companies in the right direction to sign up for this. So there's that one, which is good. "The second one, which is good, is teaming up with the UK prime suppliers and using Australia as parts of their supply chain, which is something else that we are working on very hard, particularly as most of our larger companies have substantial assets here in Australia. And making sure that Australian companies are able to become part of the supply chain back to the UK is something that we're pushing for quite heavily." Companies looking to register with UK's MoD can sign up here. BAE Systems is offering the Type 26 Global Combat Ship Australia (GCS-A) for the SEA 5000 project. Fincantieri of Italy is offering its FREMM design while Spain's Navantia has put forward its F-5000 design for the project. The winner will be announced this year. The vessels will replace the Anzac frigates from the mid 2020s. The UK company has said it will establish a digital shipyard that will transform Australia's shipbuilding industry and facilitate a transfer of intellectual property and technical data, including the digital ship design optimised for the production of the Global Combat Ship. The innovative digital shipyard will bring the "ship to life" during its service life, with intelligent systems, both on board and linked to those ashore, that will monitor the performance of the ship and its systems. The digital shipyard will also include an inventory of parts, including cost and acoustic signature, suppliers and their details. BAE Systems also recently unveiled its workforce mobilisation strategy for the SEA 5000 project, with a recruitment strategy that will include an Early Careers Program to create a pipeline of apprentices and graduates throughout the build phase of the $35 billion project. The UK contender will commit to apprentices in steelwork, mechanical, electrical and technical trades, who will be central to the company’s strategy to ensure the right breadth and depth of skilled workers are brought into the multi-decade program. The company is anticipating that, at its peak, the Early Careers Program will have a population of around 150 apprentices, which will continue throughout the 35-year program. A graduate program for business and engineering students will also offer opportunities for international placements across the company’s global business.